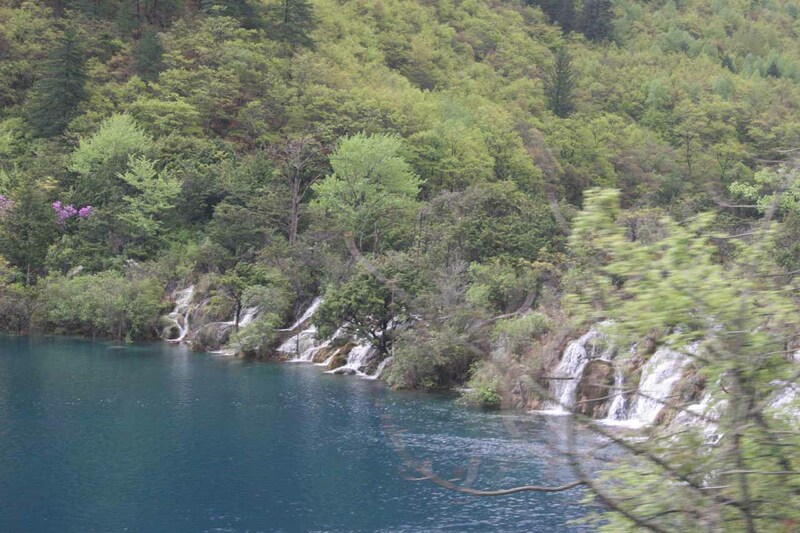 Our Tibetan guide said the Pearl Shoal Waterfall (珍珠滩瀑布 [Zhēnzhū Tán Pùbù]) was the most beautiful waterfall in the Jiuzhaigou Nature Reserve (九寨沟自然保护区 [Jiǔzhàigōu Zìrán Bǎohùqū]; 9 Village Gully). I guess it was rather subjective whether this waterfall or the also-popular Nuorilang Waterfall was the more scenic one. 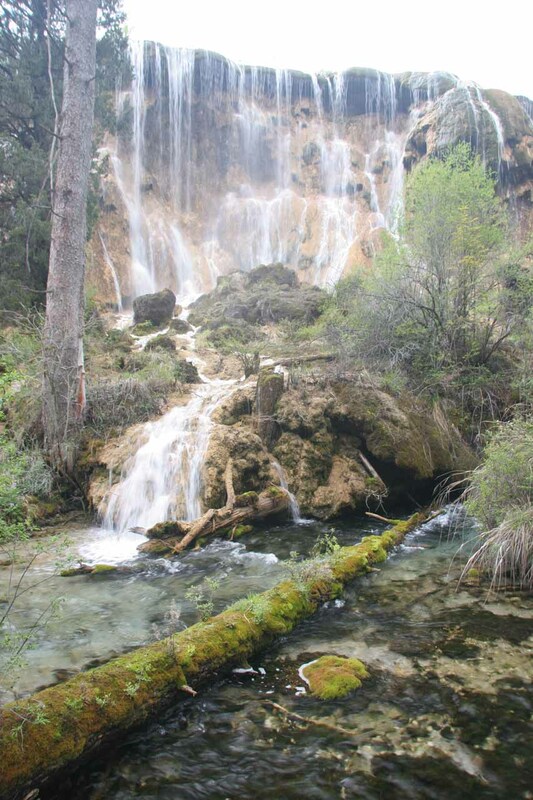 To Julie and I, both waterfalls were very similar in that they were both wide river waterfalls with interesting limestone cliffs making up their drops providing an interesting texture while the waters were weaving their way between plenty of vegetation growing both within and around the watercourse. 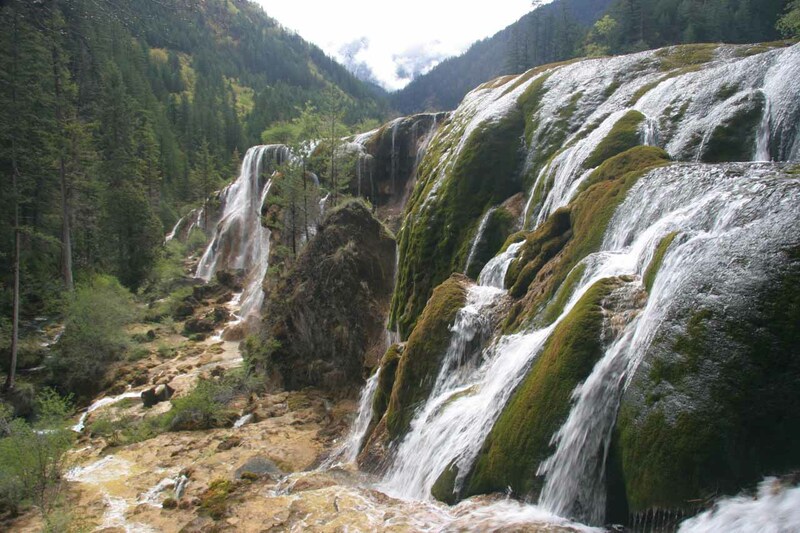 But regardless of whichever one we thought was the most scenic waterfall in the reserve, we tended to think that the overall scenery of the Jiuzhaigou Nature Reserve was what took the center stage. 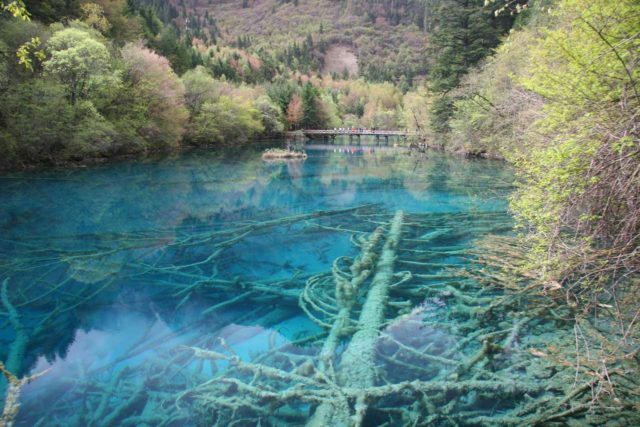 That was because the colorful and clear lakes that seemed to be the signature feature of the reserve that shattered any preconceived notion that we had of China being over-industrialized and heavily polluted. 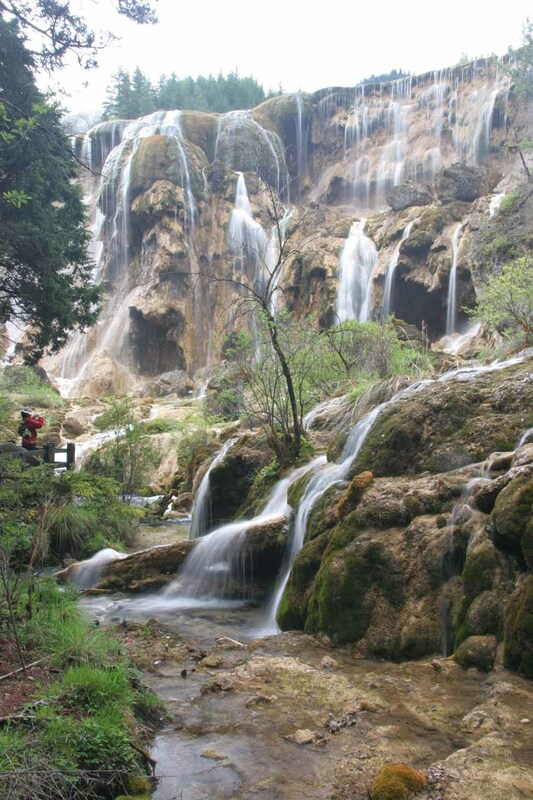 Indeed, it seemed like Nature was allowed to prevail in this fairly remote and mountainous part of the Sichuan Province, and as a result, the waterfalls seemed to be that much more beautiful. 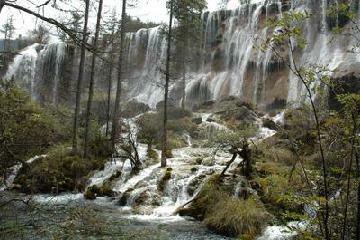 The Pearl Shoal Waterfall was the first of three waterfalls in the reserve that we saw by foot. 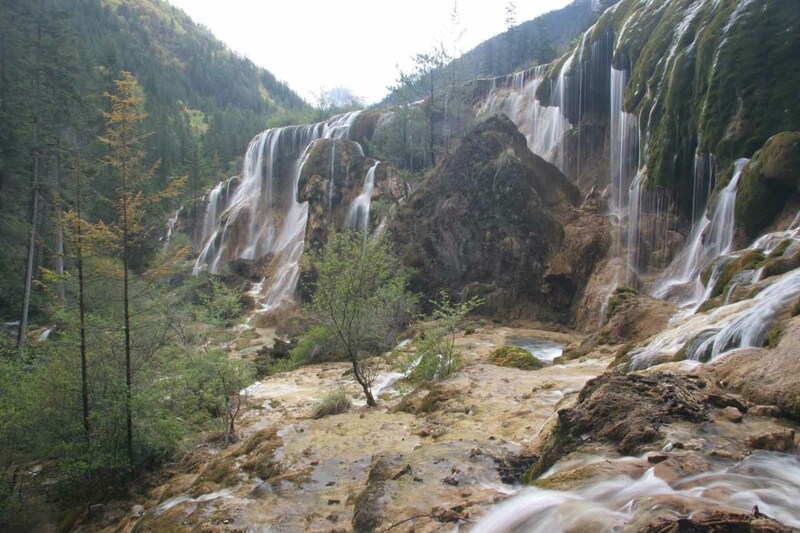 It turned out that this waterfall was fairly typical of the cascades that run through the Jiuzhaigou Nature Reserve as the water tended to be rich in minerals (e.g. 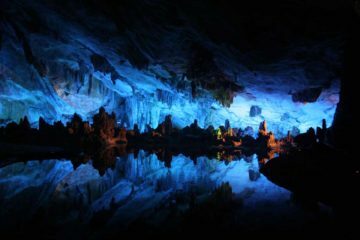 calcium carbonate or limestone), which gave it the cave-like textures (e.g. rounded bumpy ledges, alcoves, overhanging travertine, etc.) you see in the photos on this page. 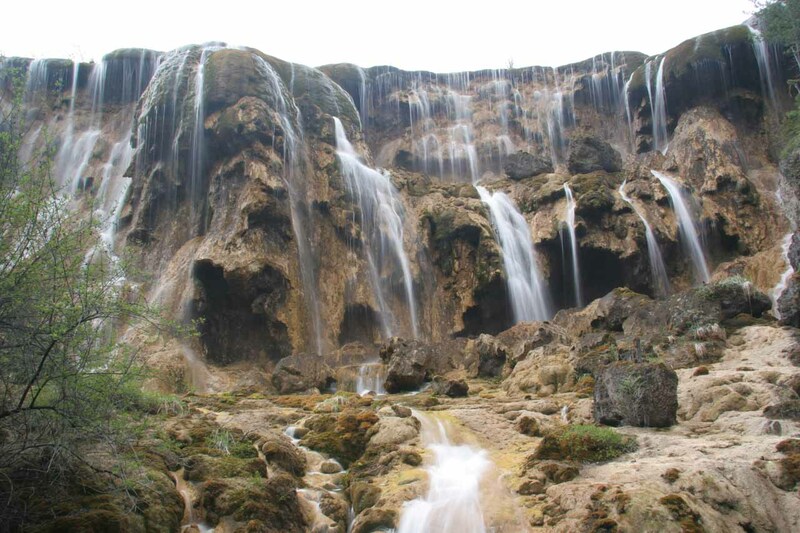 As for dimensions, the Pearl Shoal Waterfall was said to have a width of about 163m and a height of 21m. But on a clear day, it was said that we might have been able to see this waterfall with the backdrop of stunning alpine mountains. And in Autumn, we probably would’ve enjoyed the place even more when the leaves would change color and provide even more contrasting colors to the scenery. Unfortunately as you can see from the photos on this page, neither of these things happened, but perhaps that means Julie and I have an excuse to come back here under more optimal circumstances. We experienced this waterfall as part of a one-way downhill shuttle hike by getting off the mandatory shuttle at the Five Flower Lake stop (also known as Multi-colored Lake). We noted that private shuttles costed extra, which we opted not to do. 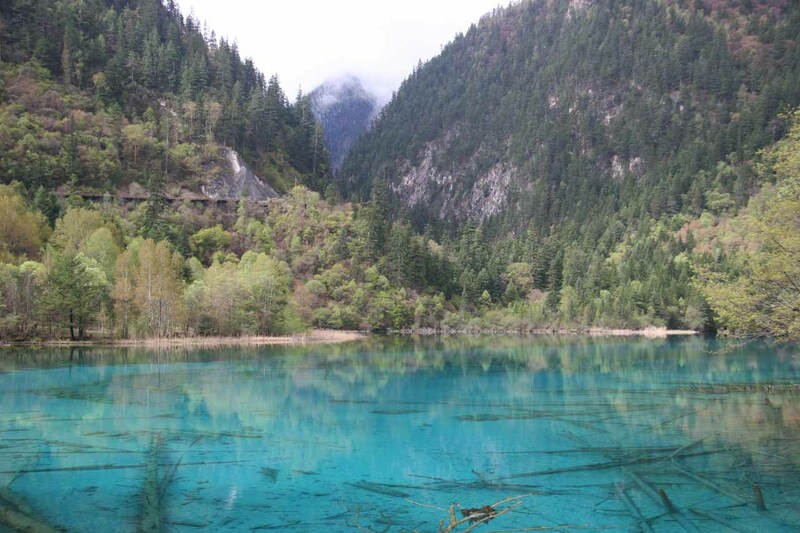 The Five Flower Lake stop was two stops before the Arrow Bamboo Lake and one stop before the Panda Lake stop. 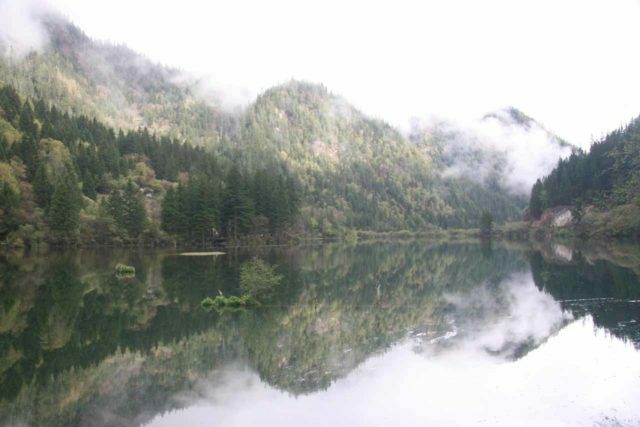 Apparently, Arrow Bamboo Lake was where the movie “Hero ” was filmed. 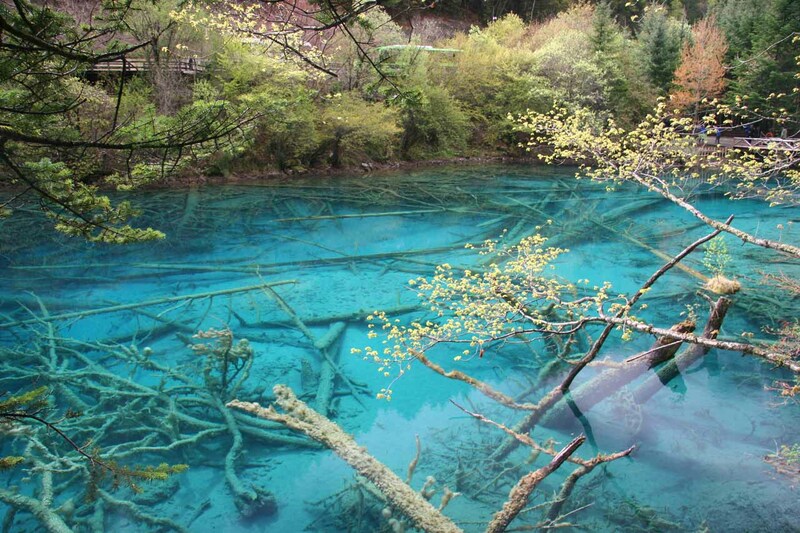 Meanwhile, Panda Lake was where there was supposed to be a 76m Panda Lake Waterfall nearby. Unfortunately during our visit, it was dry (apparently late April/early May was not a good time of the year to see waterfalls here) so we didn’t linger around for it. If we were to re-time our visit to see more water, we probably should’ve come here around August through October. 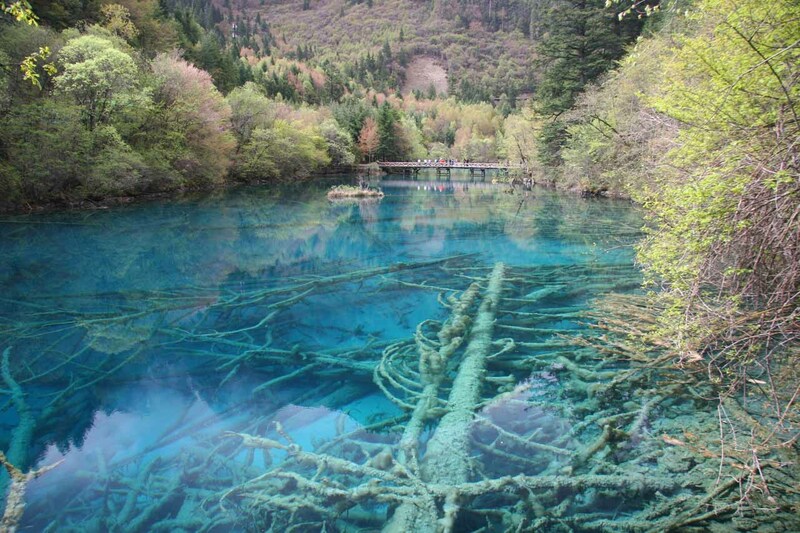 In any case, we definitely spent a good deal of time on the well-established boardwalk amongst the very colorful Five Flower Lake (which also goes by the names Multi-colored Lake or Peacock Lake). 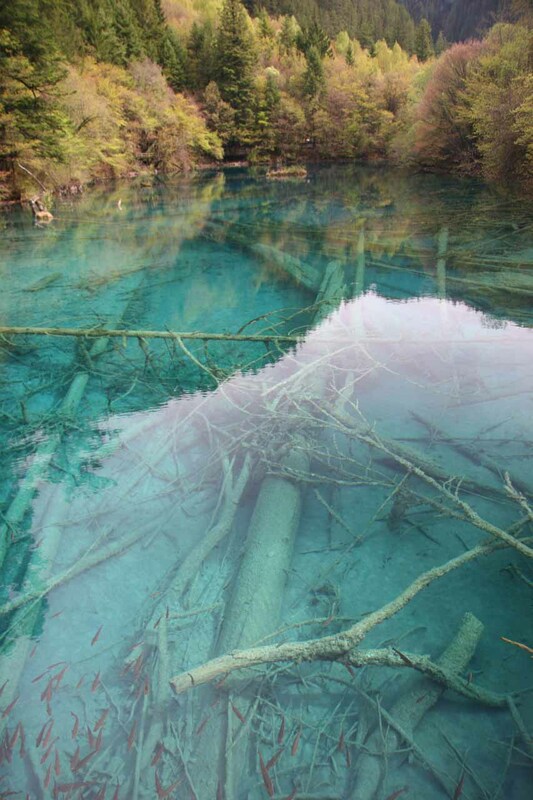 That lake gave us plenty of photo opportunities as the water was a very colorful and clear blue with submerged calcified trees within its depths and snowy mountains rising in the background. Beyond the Panda Lake and waterfall vicinity, we then continued on a boardwalk that gently descended alongside the percolating watercourse amidst a forest. Since we started our tour early in the day, this was probably the quietest section of our walk, but the tranquility didn’t last for long as the large tour groups would eventually make their presence felt. Eventually, the gradual descent on the boardwalk led us to the side of the Pearl Shoal Waterfall. It probably took Julie and I between 20-30 minutes of walking to get to this point. Then, we proceeded to descend further down the trail alongside its 21m drop where we probably took our most attractive photos of the falls (see photo at the top of this page) as the only way to capture the entire length of the falls was from its side due to its very long width. 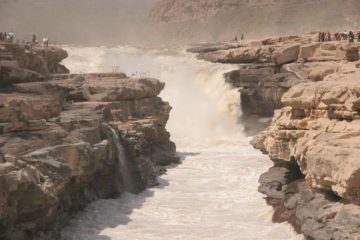 Once the stairs ended its steep descent and rejoined a boardwalk that went right across the front of the waterfall, that was when we were able to look more closely at the underlying cliffs making up the falls from a few lookout spots built into the boardwalk. It was from here that we knew there would be absolutely no lens wide enough to capture the entire waterfall from here. Perhaps the only bad thing about our morning visit was that the muted sun was somewhat against our line of sight so the lighting was a bit harsh. It might have been a case where an afternoon visit would’ve produced better lighting conditions. Beyond the opposite end of the Pearl Shoal Waterfall, the walkway ultimately arrived at another shuttle stop a few minutes later. Aside from the crowds (which came and went in waves), it was a thoroughly enjoyable nature walk. If we had to do it all over again, we probably would’ve taken the exact same route. 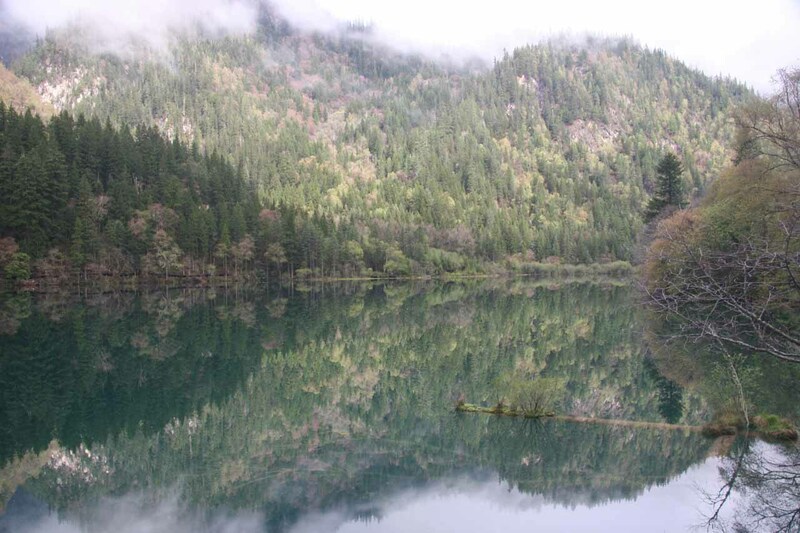 You can think of the Jiuzhaigou Nature Reserve’s road system like a backwards “h” where the Nuorilang Waterfall and tourist center is right at the joint of the backwards “h”. Our guide made sure we were on the bus that took the road to the west of the visitor center going past the Mirror Lake. Unless you have money to burn to take one of the private transport options, you’re probably going to do what we did and join the crowds by taking one of the shuttle buses that transport you to most of the designated stops within the park. 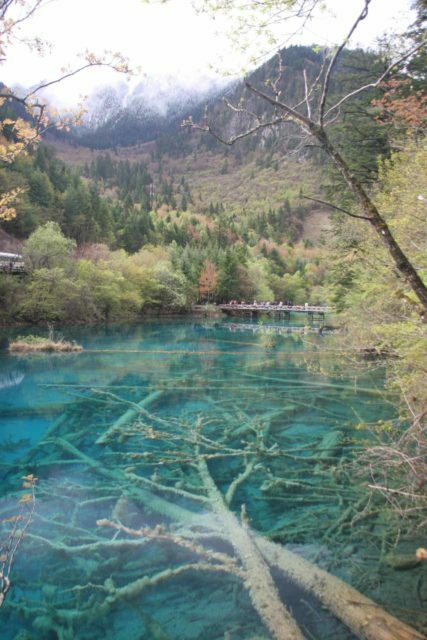 As mentioned earlier, we started the hike at the Five Flower Lake (Multi-colored Lake), but that was after we visited the Arrow Bamboo Lake and Panda Lake (hopping off and on the shuttle to visit those attractions and save a little time by minimizing the amount of walking). 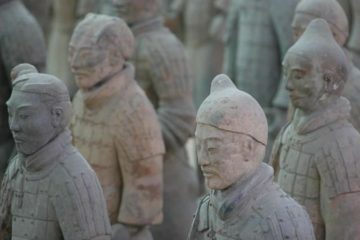 Since we were on an escorted tour, we can’t say exactly how to drive to the reserve from the Jiuzhai Airport, but it was probably around a 90-minute drive. 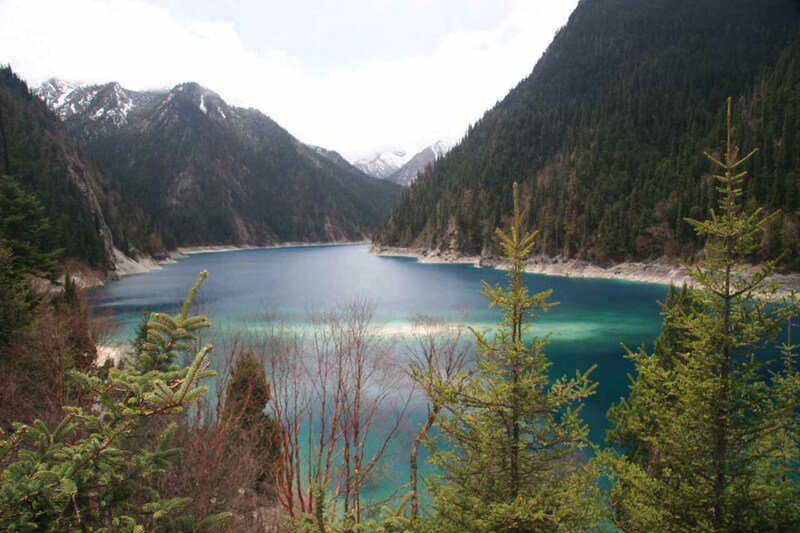 We overnighted in the village of Jiuzhaigou just outside the park entrance.